Dimensions (H x W x D): 12 11/16" x 8 7/8" x 10 1/2"
Whether you're just starting out in desktop recording or you've already laid down a few thousand tracks, you've probably heard about KRK Rokit Powered Studio Monitors. After all, for years the Rokit has been a popular choice for accurate monitoring in home and project studios large and small. Rokit enthusiasts include guitar and bass players, electronic musicians and re-mixers, beginning artists and industry professionals. 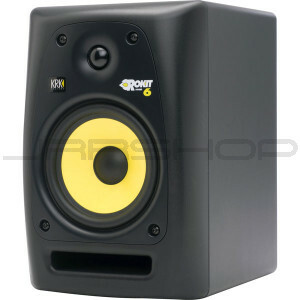 But now is a great time to check out the all-new, Generation 2 Rokit Powered Studio Monitors. Generation 2 Rokits set a new standard with even better performance and accuracy, raising the bar once again. So "getting ahead of the curve" means even more than ever. KRK's new Generation 2 Rokits have radically curved edges that virtually eliminates diffraction and provide a wider sweet spot. The Generation 2 Rokits have an even more accurate response curve. Matched to a great new cabinet and custom drivers, the true bi-amplified and active crossover systems provide smooth and accurate reproduction across the spectrum. Designed for a studio, and not just a showroom demo, Rokits allow you to hear your "real" mix.